TGIF! I don't know what is going on this week, but I'm so happy that it's almost the weekend. I have felt so tired, unmotivated, and generally blah this week. I think it's the looming feeling that winter is almost here. Anyone else feel that way? Well, our Fall Family Challenge is on a downward slope to being finished, and T brings us to the tradition of trimming the tree. As I mentioned before, ours was up well before Thanksgiving because we were expecting family! It's not very often we get visitors, so it was more special to be able to share our tree with others than to just have it all to ourselves. 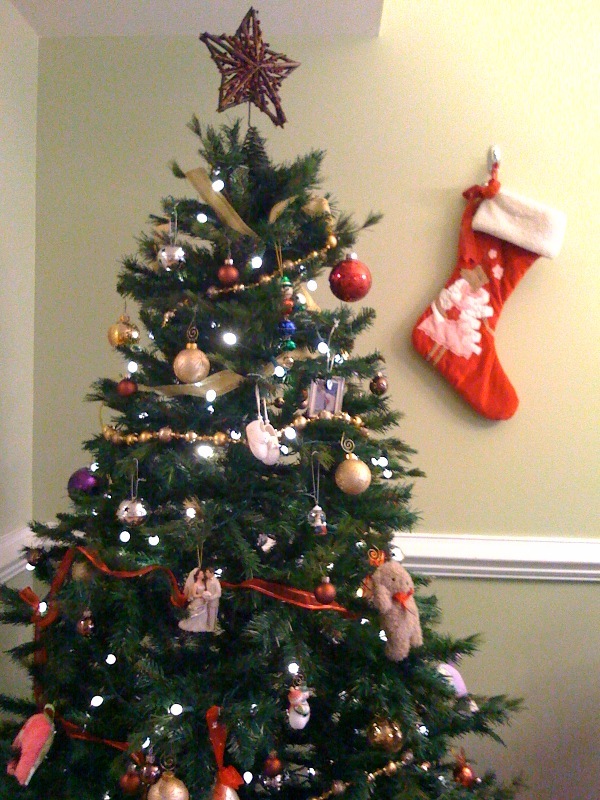 The tree looks so small in the picture above, but I think that it's because our daughter's stocking is so huge! There are so many fun ways to decorate the tree and traditions to start or keep. Here are a few of my favorite ideas that I've come across. Over the last few days, I've heard so many people talking about how they let their children have their own, smaller version, Christmas tree. I LOVE this idea! My husband knows I'm obsessive with the way our tree looks, which is why he was secretly too busy to help me decorate it this year. (That's right babe - I'm onto you.) It won't be long before AJ is wanting to get in on the decorating too. A kiddie Christmas tree is the perfect way to share the holiday tradition and let her be creative in her own way as well! Check out this awesome post from Chica & Jo about decorating a miniature tree for charity. As in the picture to the right, you can decorate a miniature tree with gifts (like these little princess accessories for girls) and bring it on over to your local children's hospital! It's a decoration and a gift all in one for a special child that has to spend the holidays in the hospital. Get together with your office or school to have a competition to see who can make the coolest tree, and make a party of handing them out! One of my favorite Christmas crafts as a kid was making a Christmas Tree door banner (that my parents still put up year after year!) I was 9 or 10 years old at the time, and my catechism teacher brought in cloth cutouts of trees in different green patterns. At the top of each one she'd hand-sewn on a pop can tab for a "hook" to hang the tree up with. To this day I still think this is such a genius idea and a wonderful way to recycle pop can tabs! The project was SO easy... use buttons from her HUGE stash and ribbon to decorate our trees with some fabric glue. There was nothing spectacular or complicated about this project, and I just remember how much fun it was to pick out different buttons as ornaments. I can't wait to do this project with my daughter in the coming years. Let Martha Stewart do the work! Sometimes we just don't have the time or the space for a Christmas tree. For instance, when we first moved to Manhattan, my husband and I shared an apartment in West Village that was 250 sq. ft. - TOTAL. In other words, no room for anything decorative that wasn't essential to every day living. Print out a picture of your favorite decorative tree and frame it. The holiday cheer up on your wall will make your small space feel more inviting. You've definitely gotten me in the holiday spirit. Oh my - I am so behind. I haven't even thought about taking out our decorations yet! Maybe this weekend. Alissa at Circus Daily had another cool try idea: http://www.circusdaily.com/2010/11/2010-holiday-ideas-decorations.html - an eco-friendly Christmas tree decal. That would be a lot safer/easier than the lights and ornaments that are going to be tempting Nate's curious little hands everyday! How many times will I be saying, "No, don't touch that!" ?! Great ideas! Your tree looks great! Stopping by from the blog hops. Hope you will visit and follow either or both of my blogs. Have a very blessed Thursday! !